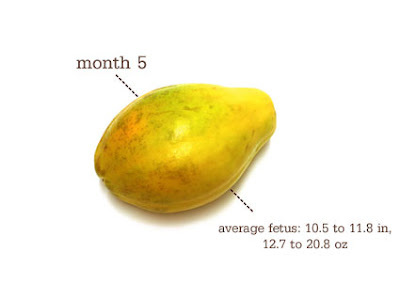 Apparently we're looking at a papaya for the entire duration of month 5. I guess this is when the growing slows down and the nitty gritty developing starts. His personality is sure formed. He is so active. Much more than any other women's reports of activity I've read so far. He just goes non-stop. Greg and I laid in bed and watched the show. It really does look like an alien trying to bust out of my stomach. I always thought it was weird that people described it as that but something clicks when you see your belly button moving independently of any command you give your body. I can't believe I am a mere 1.5 weeks away from being 6 months along and 3 weeks away from my THIRD trimester. What the heck? How did that happen? We haven't even started on the nursery yet. AAaaahhh!! I still don't feel that I'm showing too much. I'm much smaller than any pictures of women at 23 weeks that I've found online so far. I more so feel that my ribcage has gotten very wide. I always wore a 34" size bra and I don't think I could have a prayer of getting one of those bad boys buttoned up right now. My ribs feel huge and ache often. Terrible pic and don't mind the Christmas wreath in the background (I know its March but try telling Greg that....hem hem....Christmas lights). My mom made that amazing thing and I don't have a safe place to store it yet. I promise I will be wearing make-up and real clothes for the next pic. I just felt guilty that I'm 23 weeks and haven't taken a pic yet. In all reality, I just started showing. If I'd taken pictures sooner, they would just be of a thick-looking me. No one wants to see that. We were blessed enough to have someone give their crib to us for FREE!!! When I said I'd take it, all I knew was that it had dark stain. I knew that if it was terrible, we could always find something to do with it or some place to donate it to. I wasn't about to turn away a free crib; especially one with dark stain. My wonderful parents picked it up and brought it over last night. It was so much better than I imagined it would be. I was told it was lightly-used 13 years ago for a little girl so I had no idea what to expect but definitely not something this great! As you can see, its already housing everything we've received for our little man.